Passed away peacefully on Tuesday, December 19, 2017. He was 84 years old. Vito John Surian was born on April 4, 1933 in Saginaw, Michigan to the late Nicholas and Vincenza (Corrado) Surian. He married the former Suzanne Mary LeRoux on September 1, 1956 at St. Joseph Catholic Church. 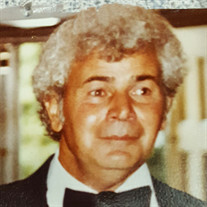 Vito attended St. Mary’s High School in Saginaw, later attending St. Joseph Preparatory School in Grand Rapids, graduating in 1951. Following Graduation, Vito attended and graduated in 1957 from the University of Detroit, majoring in English and Latin. He attended and received his Master’s degree in Secondary Administration from Central Michigan University. Vito also proudly served his country by enlisting into the Army ROTC. He taught English and Latin to various High Schools across Saginaw Country, retiring from the Swan Valley School District in 1986. Vito taught as an adjunct faculty member for Saginaw Valley State University, Great Lakes Junior College and Baker College. He was an avid fisherman, fondly known as “Captain Video”. Vito also liked working on jig saw and crossword puzzles. Vito was famous for making Italian sausage and cannolis. His dogs held a very special place in his heart. The family would like to extend a heartfelt thank you to the staff at Saginaw New Hope Valley and Auburn Heights Senior Care for all the love and care they provided to Vito and the family. Surviving are his wife of 61 years, Suzanne “Suzy” Surian of Saginaw; three daughters and a son: SueAnne (John) Spreeman, Janice (Greg) Smith, Paul Surian and Roseanne (Ed) Podany; eight grandchildren: Benjamin, Jillian, Wesley, Kara, Jenna, Nicholas, Bryan and Mitchell; nine great-grandchildren: Alaina, Lydia, Noah, Lila, Lola, Dominic, Gage, MaKayla, Isaac and Carter; and one sister, Olympia DeAgostino. Also surviving are many nieces, nephews, extended family members and friends. He was preceded in death by a daughter, Mary Beth Barnes; four brothers and four sisters: Dan, Frank, Amadeo, Vincent, Virginia, Angeline, Joanne and Anna Marie. FUNERAL: A Funeral Liturgy will take place at 11:00 a.m. on Saturday, December 23, 2017 at Holy Spirit Catholic Church, 1035 N. River Road. Rev. Fr. Peter J. Gaspeny and Rev. Fr. Joseph A. Schable will concelebrate. Honoring Vito’s wishes cremation has taken place. Burial will take place at a later date in St. Andrew Cemetery. VISITATION: Friends are welcome to visit with the family at the church on Saturday from 9:00 a.m. until the time of Mass at 11:00 a.m.
MEMORIALS: In lieu of flowers, those planning an expression of sympathy may wish to consider memorials to the Mexican American Council Loan Assistance Program or to the family c/o Suzanne Surian. Please share your thoughts and memories with the family at the church or through www.deislerfuneralhome.